Destined for the dance floor, this short teal blue homecoming dress by Dave & Johnny is a full and flirty style that twirls to perfection. The charming junior-size party dress has a fitted bodice with a daring deep v-neckline. Two sets of triple shoulder straps provide stability before criss crossing over the open back. Defining the natural waistline, this whimsical short party dress has a wide band that tops the flirty a-line skirt. 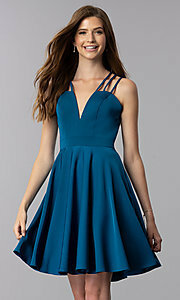 A lovely style for weddings and family celebrations, this short teal blue homecoming dress, under $150, offers a playful, yet captivating look for your semi-formal event.